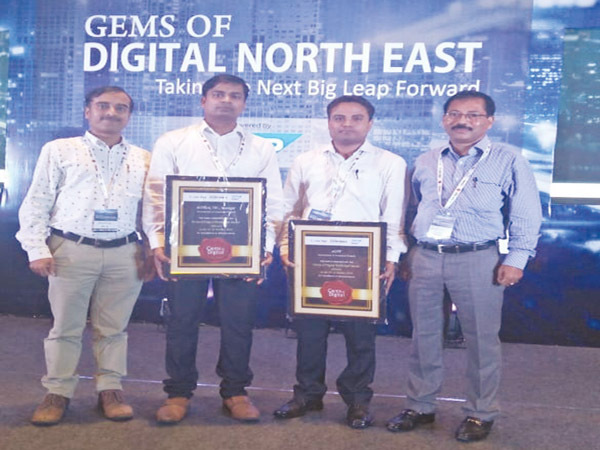 GUWAHATI, Oct 31: Arunachal Pradesh bagged two silver awards under the ‘Gems of Digital Northeast Initiative’ in a function held here in a city hotel on Wednesday. The awards were received by District Informatics Officer Tarani Kumar on behalf of the Capital Complex district administration for e-office at the DC’s office Itanagar and Bimal Borah and Jyotish Roy of NIC, and Treasury Officer Gautam Saha for e-GPF implemented at the Directorate of Accounts & Treasury. Regarding the successful implementation of e- office, Kumar informed that the office of the Capital Complex deputy commissioner is the only DC’s office in the entire north east India to have adopted e-office, making it a paperless office. This is the third award for the e-office implementation in the district office after the National e-Governance award and Skoch award received earlier this year in the month of February and June respectively. Kumar lauded the effort of Capital Complex DC Prince Dhawan in adopting e-Office to ensure transparency and accountability in the system of file movement. The transformation has brought faster delivery of service, accountability and transparency in the workings of the office. It has also added value to the human resource of the office with continuous training, making them technology savvy. The office has procured computers for all the officers and ministerial staff of the office and has been conducting multiple trainings on the use of computer and e-office, the DIPRO reported. Further, to tackle connectivity issues the office has procured multiple connections such as leased line and private net. The office has enabled access of e-office over virtual private net (VPN) which enables use of e-office from any internet service provider and from anywhere. Bimal from NIC informed that e-GPF provides an Internet based GPF solution for government employees of Arunachal Pradesh. This e-governance initiative facilitates GPF subscribers to interact with the Directorate of Accounts and Treasury through the portal, thus serving as a communication tool between the government and its employees. It follows a transparent approach in providing a comprehensive resource of GPF related information open to all accounts holders and accounting units.